If you’re still working, now is the time to develop a hobby and to plan for future senior activities. It's also a great idea to have several different hobbies, because things change as we age. Working with our hands at any age is particularly valuable. It promotes brain and physical coordination. To get started with finding a hobby, here are some questions to first ask yourself. Take some notes and let yourself brainstorm. And keep in mind, as you do this, that some of these may be good extra income ideas and actually provide ways to do a little work after retirement if you're interested in that. • Make a list of the top 5 hobbies or activities you like to do now. Here’s a list of hobby ideas to help get your imagination moving. Finding a hobby can be a really fun exercise and will give you ideas on how you can expand the list. Jot your ideas down. Some can be done solo or with groups. • Learn another language – and take a trip! 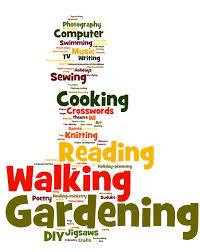 When finding a hobby, remember, there may be a craft store, home improvement store, community resources or a senior center that can teach many of these activities. And don’t forget the library – most of them have or can get videos and books on a favorite topic. Or do you have a friend or family member who can teach you? Groups are always fun. See our page about elderly activities to get ideas for those with limitations that we experience as we age. Also consider reading books, watching movies or TV programs, attending seminars or conferences on the subject, or helping others. Find out what other related senior activity ideas and groups are available. There are also many special crafts for elderly to consider – ask a local senior center or even a church group. After finding a hobby (or two) dedicate a room or area in your home to your special activities. Make a list of the supplies you will need, and find out how to get discounts. And don’t forget to give back, if you can – teach someone what you know. Pass it on to family members, youth, and the elderly. Give wing to your creative ability. Mail your contributions to haridas@lifegoeson.in and check out the homepage regularly!